This dish is good at room temperature but if you want it hot, just reheat the wedges in the oven. Preheat the grill to its highest setting. 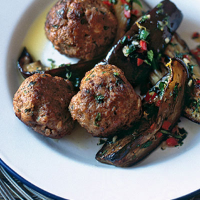 Put the whole aubergines on a tray; grill for 30 minutes, turning often, until softened. Cool. Halve and scoop the flesh into a colander. Drain for 1 hour. For the wedges, preheat the oven to 190°C/gas 5. Put the aubergine pieces on a roasting tray. Brush all over, using 4 tbsp olive oil; season. Bake for 25–30 minutes, or until soft. Stir together the remaining ingredients with the rest of the olive oil. As soon as the wedges come out, brush with the dressing and set aside. Meanwhile, put the aubergine pulp in a bowl. Add the remaining meatball ingredients, except the oil. Mix, then shape into 12 balls. Add more breadcrumbs if the mix is too wet. Put on a tray, cover with clingfilm and chill for 30 minutes. Heat 1 tbsp light olive oil in a frying pan on a high heat. Cook half the meatballs for 4–5 minutes, turning until golden all over. Repeat with the remaining oil and meatballs. Transfer to the oven for 8 minutes, until cooked through. Meanwhile, mix the ingredients for the tahini sauce with 50ml water to form a runny paste. Put a few wedges on each plate and top with 3 meatballs. Sprinkle over the parsley and serve with the tahini sauce.